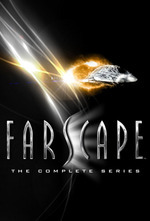 I had watched a couple of episodes before this one, but this was the point where I really took notice of Farscape. A time travel story where our hero turns a triumph into an atrocity? With no "reset button"? I was sold, and followed the rest of the show closely. It's definitely another Star Trek episode, but without the Star Trek ending. It was fun jumping back in time and yet again, the name Crichton takes on historic means. Not a lot to say, but simply a fun episode. Yep, this is an example of an "anti-Trek" episode that Farscape does so well. In the companion book, David Kemper says: "Everyone expected us to put history right, because they grew up watching Star Trek...But that's not the Farscape way." No kidding! I actually have a difficult time watching this one because it is so tragic. The end where John and Aeryn are just sitting in misery, ugh! The crew of Moya have gotten people killed before. They've gotten a lot of people killed. This takes it to a new level by getting people killed who were already dead when they arrived on the scene. To be fair to them, they do manage to work their way back from global annihilation. Which must be a pretty surreal feeling for the people on the planet. "Okay... this is going to seem odd, but did you just sense a lacuna where your very existence, possibly all our existences, was nothing but an echoing phantasm of probability howling across a planet progressively more devastated until all that was left was the embers of a terrible fire, hanging in space?" "Kinda, I thought it was more a nightmarish glimpse of a possible past where we had descended ever deeper into a hell of mutual slaughter that had ultimately only left a scattered handful to bear witness to a murderous obscenity on a scale that cannot be properly articulated by any sentient being." "Huh." "Yeah." Aeryn: You know if we did change things, it is possible that we could improve the future. John: With our record? You think that's gonna happen? This is one of the episodes I point to when I talk about how Farscape is the anti-Trek. I don't know of another show that would take this old trope and upend it so thoroughly.